Since I'm back, Let's Talk about Sarah, Shall We? It is a very serious thing in this household.. As you can see. I was so excited a couple of weeks ago to learn about the National Championship Celebration that would take place at the stadium this Saturday. I went straight to my calendar and penciled you in. I told the Husband it would be a great day to go down to the loveliest little village and hang out with our girls.... not really thinking about it still being January. January = Cold... Me no like cold. I started watching the weather hoping that we would get one of those oddball 60 degree days and we would just have a grand ole' time. As this weekend approached there were rumors of more snow and ice and of course, freezing temps. At last check the temps were only going to be in the upper 30's... Me no like cold. So after consulting with the Husband (who, come to find out didn't really want to go anyway) we decided that it just wasn't in the cards. I'm not the type of person to load up all of the things I will need for the day for all 3 kids, drive 2 1/2 hours for a first come first served situation where the best result is that I'm granted the opportunity to sit in 30 degree weather with 3 kids, 6 gloves, 3 hats, 3 heavy jackets, 6 lovies, umpteen layers of clothing and no vodka. I love you but..... Not this time. Since the shooting in Tuscon, Sarah Palin's smug little mug continues to pop up all over everything I seem to be watching. People are blaming her, people are defending her, and she has diarrhea of the mouth as usual. 1. You star in a reality series that you want people to watch. 2. You write a book you want people to buy and read. 3. You travel around and endorse candidates that you want people to vote for. 4. You have a FB page you want people to like. 5. You speak at Tea Party conventions where you expect people to listen to you. 6. You say something like "Don't Retreat, Reload" so that people will....... What? Reload? The only one "physically" responsibl­e for the shooting is Jared Lee Loughner. I get that. But I also think Sarah Palin is incredibly irresponsible with her actions and words, and I'm guessing that since her map with the crosshairs (Er... Surveyors marks for dryholes... blah blah) were immediately removed from her site, that someone in her camp thought that might not look so good either. Our Nation as a whole is abundant with people who are unstable and living on the edge. Palin is preaching hate and inciting violence to gun toting right wing extremists. Why would we think that something like this wouldn't happen eventually? We've been stuck in doors since Sunday (mostly) while schools and businesses continue to stay closed because of this "winter storm" that passed through. It brought mostly ice that won't seem to go away... like ever. We ventured out with the girls on Monday to play, we couldn't build a snowman, but did teach them the finer art of karate chopping ice chunks.. It occupied them for a while. Thought I would show proof that I actually did go out in the cold, an incredibly rare occurrence. And yes, I was out there longer than the time it took to take these 3 pictures...... Barely. 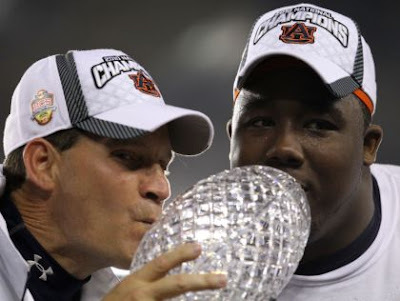 You had to know that something like my beloved Auburn Tigers winning the National Championship would bring me out of bloggy hiding... So here I am and can I just say... Damn! It's great to be an Auburn Tiger? What an amazing season we've had and how awesome has it been to watch Cam Newton (the best college football player evah') play for our team! The weather threatened to dampen our plans but after several phone calls, we came up with a plan b, booked a room at the Winfrey and walked our asses across the icy parking lot to OnTap, one of the only bars open. We drank, cheered, drank, and cheered and drank some more! We stumbled back across the icy parking lot, passed out in a drunken stupor and woke with a Championship Hangover, it's the best hangover I've ever had!